Today's most talented designers are exploiting the gorgeous possibilities of mixing hardwood flooring planks in variable widths. It's all the rage amongst trendy decorators and homeowners! Our variable-width flooring allows you to mix wood planks of 4, 5 and 6 inches together to create a stunningly stylish look. 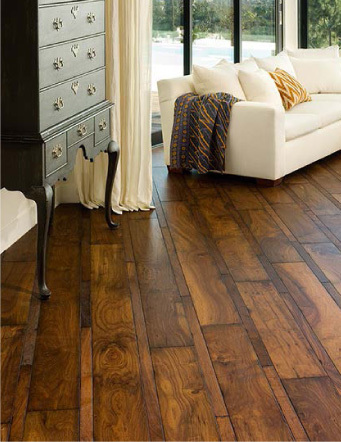 To complement the scale of your rooms, you can emphasize the 5-inch and 6-inch planks in larger rooms, and 4-inch and 5-inch planks in smaller ones. Or use your creativity to really mix it up! You can take advantage of the variable widths to play up architectural features of a room, such as a bay window, door, alcove or fireplace. And, you can use them with modern wall colors, drapes, throws and furnishings to create a "modern eclectic" look. 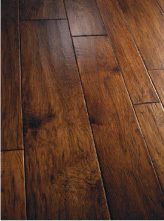 With variable-width flooring, you can let your creativity be your guide.